Hodja Daniyar Mausoleum (Saint Daniil) is one of the most famous religious sites in Samarkand, was built in the time of Tamerlan in 1900. Daniel means “God is judge”. According to legend, the prophet Hodga Daniyar was an associate of Arab preacher Kusam ibn Abbas. 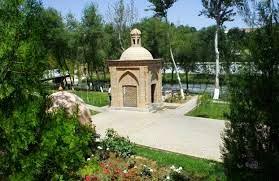 There is the river Siab not far from the mausoleum, there is also Hodja Daniyar spring. Residents of the city have used water from the river for many years. They believe in its healing powers. Hodja Daniyar was born in Jerusalem in 603 BC. According to legend, during the campaign in Asia, Amir Timur was interested by Suz city; he heard that the spirit of the Prophet protects the city from all misfortunes. Then the great military leader made a pilgrimage to the mausoleum, deciding that his city should be rich and prosperous. Nowadays the mausoleum with six domes (only five domes are preserved) is a crypt length of 18 metre. Thanks to the surviving photographs, it is known that the original tomb was covered with river stone. South part of the headstone is 90cm, the north – 160cm. 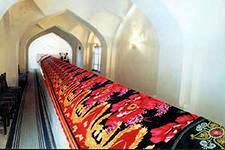 As there is a quadrangular Sagana on the north side, it is 2 meters wider than the south. Patriarch Alexiy II visited the mausoleum in 1996. It is noteworthy that the half-dry pistachio tree that was 500 years old, it blossomed again after the Patriarch blessed it. Hodja Daniyar Mausoleum is the place of pilgrimage not only local residents but also visitors from around the world as it is revered by Muslims, Christians and Jews.